That there’s a major international problem with counterfeiting is beyond doubt. So, too, is that fact that so many of the counterfeits on the market originate in China. How big in the Chinese problem? In 2007, 22% of all fakes seized by EU customs consisted of clothing, around 80% of it originating China, whilst in the US, during the first half of that year, fake apparel worth £10 million was seized, much of it – around 70% - coming from China. If it were just the clothing, that would be more than enough, but the counterfeits coming out of China embrace anything and everything. Most of the fakes are produced in the south of China, in Fujian and Guangdong provinces, which are heavily industrialised. It’s a problem that began early in the 1990s as China’s economy became more liberal, and criminals saw the possibilities of making a lot more money by providing fake goods, and more companies from Hong Kong and Taiwan set up factories in the provinces. Additionally, as many big names licensed their goods in China, they were essentially handing the factories an opportunity to begin making copies. In the early days, however, those fakes weren’t very convincing, with plenty of misspellings and bad English, but they’ve improved dramatically over the years. The perpetrators can be real factories that are moonlighting to make extra money, or those owned by criminal gangs (most from China or Taiwan) that own their own factories through front men, and solely produce counterfeit goods. It’s not that China doesn’t have laws to stop counterfeiters, it’s simply that the demand is high, and so are the profits. It’s impossible to police everything, and with low wages, corruption is endemic. 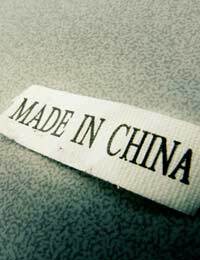 It’s estimated that between 15-20% of all goods in China are counterfeit, and getting them out of the country is easy. Some 6,000 containers leave Hong Kong every day just for the US, and only a tiny fraction of those are ever inspected. To be fair, though, Chinese police have confiscated a total of £20 million in faked items. Within China itself, markets in all the big cities sell counterfeit items; they’re what people can afford. Within the country, the factories give work to thousands of people, which might be one reason the authorities are so reluctant to take action against them. What’s Being Done About It? The problem is so widespread that the big names themselves have been forced to take action against the Chinese counterfeiters. Microsoft, for instance, has given money to help catch those faking its items, while the big designers have been far more active in sniffing out and bringing to trial those responsible for counterfeiting; in 2006, action forced Chinese courts to sentence and fine two men who were exporting fake perfume. Louis Vuitton, Chanel and Gucci have been among the major manufacturers coming together to take action against the problem, although they’ve been fighting it from the other end, to have the goods removed from China’s street markets. Recognising international pressure from both the US and the EU, China has begun taking steps to clamp down on the counterfeiters, with changes in the law, especially that relating to intellectual property, and plans for greater security. It will, though, take time before greater results are seen. Which Countries Produce the Most Counterfeits?